Since I received the ten chatter-"plates", I've been messing around with different setups. Since we use the Glow "tout" a lot on the coast, I thought a Chatter variation (top item) might fool a speckled trout or a redfish. I won't get to try that out on a saltwater fish for a month, but....I'll report back when I do. I owe the original idea to OnTheWater102. p.s. I see that the bottom bait has already pulled back from the front of the hook. I'll re-rig that before I throw her in the water. I like them! And I like that other you posted, that looked like the body was a Bass Assassin 4" or so sea shad, maybe in black sea shad color. 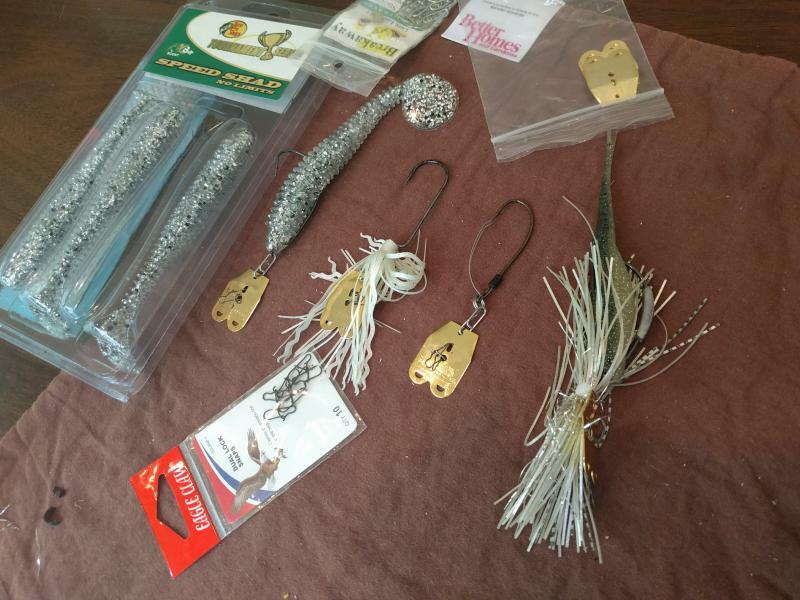 I am wondering if these will work in saltwaters on striped bass? Where/when weight is needed, do you prefer the weight in front (top) or the weight below on the hook shank (bottom picture). when fished, do you twitch them or does the chatter-blade impart its own action? Personally, this season in the sound the HOT lure has been a white Sluggo or Zoom Fluke fished weightless or as shown in the bottom lure. But if there's something I could add that would give me an edge, I'll take it! I wish I could answer some of your questions regarding what I like and what works. But, I only made them today. The one in the first post was only a couple of days ago. None have been put to the test in real fishing conditions yet. I like the idea that it is easy to switch color/size/weight of the plastic "tout" as we call them here. I guess if I had my way, I'd fish everything weightless, dead slow, and just let the plastic sink slowly to the bottom. Then, jig it a time or two, and let it drop again. But, as we all know, some days they want to chase the bait. I think a spinner bait or a chatter bait must excite them in a way unknown-to-us. If we knew the real answer, we'd be on our yachts fishing in far away places. 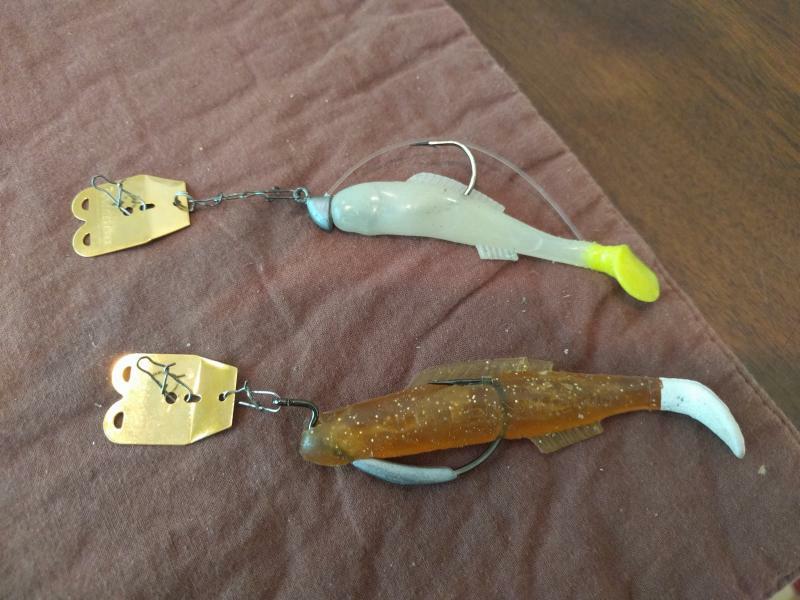 Where/when weight is needed, do you prefer the weight in front (top) or the weight below on the hook shank (bottom picture). I have no idea what is the right placement of the weight. The OP (OnTheWater102) liked his drop weight in front since it helped with weeds. Of the two I built today...the almost-clear tout on a jig, with its built-in weedless fitting, was very weedless today, in a dozen casts. when fished, do you twitch them or does the chatter-blade impart its own action? So far, I've only thrown 20 or 30 practice casts. I've both twitched also let the chatter blade do the work. I am impressed with how erratic the chatter blade makes the bait move. Ought to attract something. Thanks Rich ... will make up a few over the Winter! 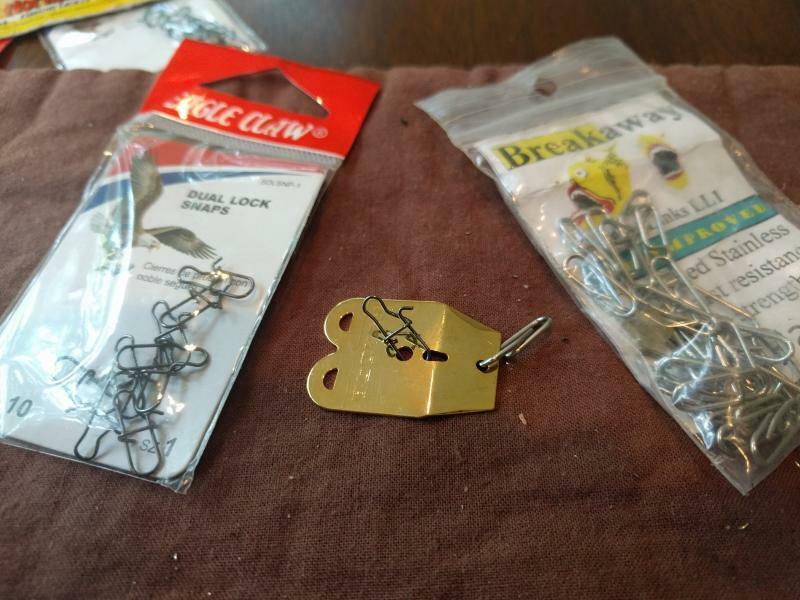 1) What make/brand and pound-test are those 'slip' connectors you're using to attach the blade to the lure? 2) If one could use a SS split ring in place of that duo-lok snap at the middle of the blade, do you think they'd be any advantage? Maybe just cheaper ... since I have a ton of them already on hand. So having never used them, nor seen them before OTW posted his excellent tutorial ... how do these work? Does the blade pulsate, swim, dive or all of the above? Does it spin when retrieved, so does it need a good bearing swivel placed 2' up? PM me your mailing address. I've got two blades not yet committed to any screwy ideas. I'll send along the other fixin's too. 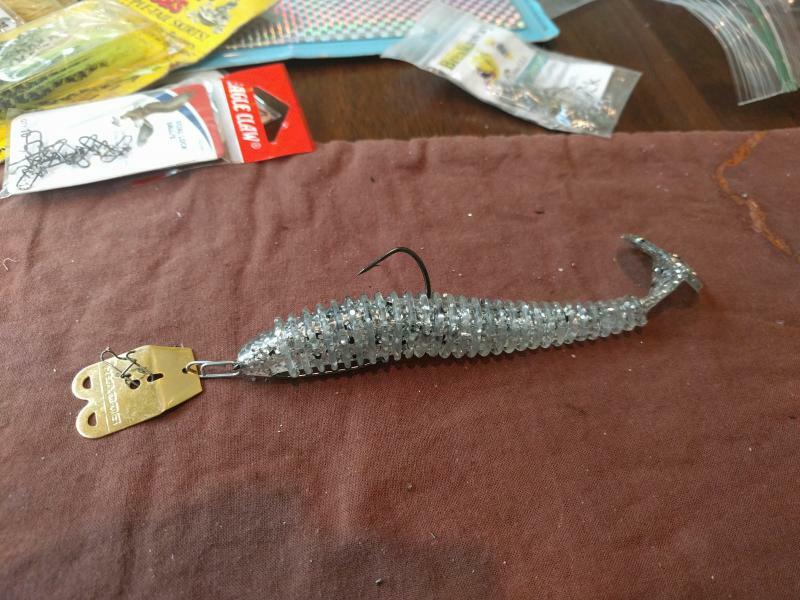 Re your query on the pound test of the fancy connectors (I'll send some of them, too) I have no idea other than they would hold a big striper or muskie IMHO. I bought a bunch of them one day a year or two ago online. They are thick. re the split rings...I cannot see a good reason why they wouldn't work functionally, I am not sure how you can get them into the tiny holes, given their shape. Try them when you get my package. What do you mean "can't try before the fish move out". It is the middle of September. You don't live in Alaska, do you? The Fall run for saltwater striped bass up here (coast of Mass) is very episodic and sporadic - be there when the fish are there and the action is outstanding, if not epic! Miss it by a day and you may have missed it for the rest of the season. Once they've gone by are - they are gone and won't be back until next May. Alaska? I just LOVE those reality shows based in AK ... but I don't like salmon , ick, iCk, IcK, ICK! Tastes just too fishy for my tastes, no matter how many different ways I have prepared it and/or have tried it. Thanks for the offer on those blades! PM sent. OK PM received, "stuff" sent. I included a couple of springy looking things that I bought one time. They are intended to allow one to screw a worm (or any plastic) on and affix it to the shank of a bent worm hook. Mess around with them and tell me your thoughts. I think that the weak point of the Chatter blade could be the blade itself. Of course, one could use undersized components and have a failure there, also. But, the Chattter blades that I bought are far thinner than what UnderTheWater102 showed in his primer. I haven't had a chance to use any of them other than a few pond casts. I'd like to hook a 20 to 40 lb Striper with one of these rigs. If it broke off, due to the blade, I'd be disappointed. We shall see. Still nursing the last of my cold. At least I got a few things done around the house while I wasn't out messing around at golf or fishing. p.s. Since UnderTheWater102 showed a very clear picture of his larger blade, I'd like to use that as a pattern and cut my own out of some aluminum. One could paint the blade any color, or even stick some holographic shiny material onto it to give the blade its flash. That way, the strength would be improved. p.s. I still haven't caught anything with my home-made chatterbaits, but I also haven't fished very much since I came back to TX. Weather broke yesterday, so I hope to improve on that statistic. I've had mixed results with paddle tails on chatterbaits. Sometimes they play nicely, others it feels like they somehow lose some action compared to a forked tail like a superfluke. You'll know right away if it's an issue or not because you really won't feel it pulsing as you draw it back to you the way it should. I don't ever use a steady retrieve with them. Move them in spurts or drag them along & kick them up when you feel them contact vegetation. One way or the other, almost ever hit I've ever gotten with one has come on the fall after the bait had been in motion.